At the height of their fame, XTC tried to anonymously release music under the name, Dukes of Stratosphear. Of course, it didn’t take long to pin the tail on the donkey, as Andy Partridge’s signature voice and the quirky, off-kilter pop style gave them away. As the Dukes, they were able to dig into their old record collections as they focused on more of a psychedelic 60’s sound while remaining true to XTC’s sound. The Dukes of Stratosphear releases have been reissued before but are being re-released today on Andy’s own Ape House Record label with collector-friendly bonus demos, extra tracks and videos. 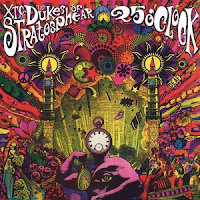 Their first release as The Dukes of Stratosphear was the 6-song EP, 25 O’clock which includes the trippy title track as well as the first single, “My Love Explodes” and the spacey noise-pop of “Bike Ride To The Moon”. It also includes demos of those songs as well as “Susan Revolving”and “Nicely Nicely Jane” which weren’t included on the original release. One of the extra recordings, “Open A Can Of Human Beans” starts off sounding like an XTC song, with it’s humorous lyrics and jangly guitar before warping into a psychedelic frenzy to end the song. The reissue also includes the video to “The Mole From The Minisrty”. The second and final release was the more XTC-sounding full-length album, Psonic Psunspot. Album opener, “Vanishing Girl” is straight up pop, drenched in Beatles melodies and Beach Boys harmonies. “Have You Seen Jackie?” plays with layers of high pitched vocals, a big organ sound and a shouted chorus that will have you shouting right along. “Braniac’s Daughter” again plays up XTC’s love of the Beatles with a melodic, piano driven pop gem with a whimsical solo in the middle. 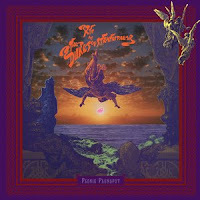 The reissue of Psonic Psunspot also includes demos of six songs including, “Shiny Cage” and “Little Lighthouse” and the video to “You’re A Good Man Albert Brown”. XTC completists will want these reissues for the demos, extra recordings and liner notes but the casual fan or new listeners will find plenty of psychedelic pop-goodness to get started on their own XTC obsession! Rush - "Retrospective 3 (1989-2008)"
3 Songs: Soft, Soft, Rock! Beep Beep - "Enchanted Islands"